In general, adapters provide a means to connect different types and sizes of components that would otherwise be difficult to connect. Adapters can save you space and reduce installation time by reducing the number of connection components required for an assembly. A typical use for adapters in a CMG tubing assembly is to connect tubing of different sizes. A barb is used to connect flexible tubing to any number of other components. Barbs are cylindrical pieces with a series of ridges that work by gripping the interior wall of a tube after a simple push-connection. Once inserted and secured, they are not easily disconnected. Due to their simple push-connection design, barbed fittings are typically used in low pressure applications (around 200psi or lower). The advantages of barbs are their simplicity, low cost, variety of materials, and ease of installation. In a tubing assembly, clamps are typically used like a valve. 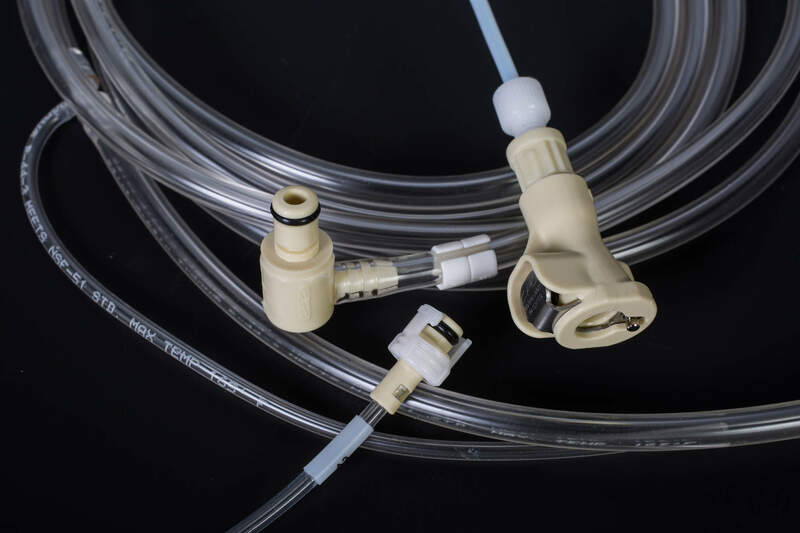 They can provide partial or complete fluid flow stoppage without puncturing or otherwise damaging the tubing. Clamps are installed over the outside of a tube, which allows them to be added to a system, even after the assembly has been completed. 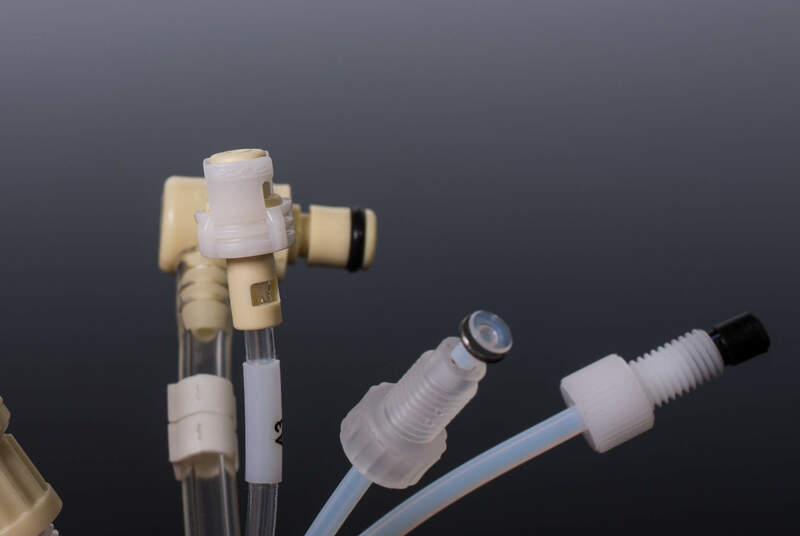 A coned fitting is a threaded component that can make a tubing connection into a coned port, and can be made from a variety of materials to suit the application. Coned fittings are often selected for high-pressure applications. A coupling is simply used to connect two tubes. If the sizes of the tubes are different, the coupling can also be called a “reducing coupling,” “reducer,” or “adapter” (which is defined above). Couplings are typically integrated to provide a secure connection that also allows for quick and easy disconnect/reconnect, which makes servicing much easier. A ferrule normally refers to a circular clamp used for fastening, sealing, or reinforcement. They are typically made from metal or plastic, and also go by the names “grommet” or “compression fitting.” An everyday example would be the metal clamp on the end of a pencil that holds the eraser in place. Ferrules can be used in a tubing assembly to join two components together with a water-tight seal, or to strengthen and provide support for a critical/high pressure section of tubing. These threaded fittings make an easy and repeatable connection with a variety of standard and custom port sizes. They can also be referred to as “flanged fittings.” The advantage of flat-bottom fittings is their compatibility with precision thermo-molded FormFit flanges from CMG. Together, they can create a chemically-inert, leak-free seal that is easily installed and serviced. CMG offers a variety of labeling services for tubes and tubing assemblies. 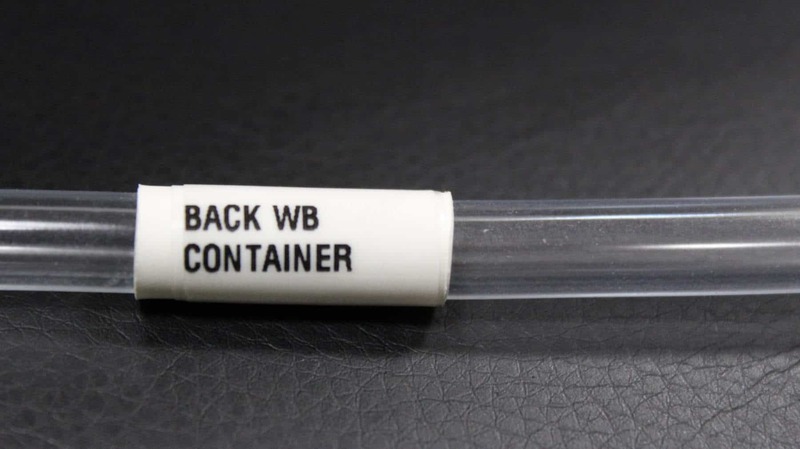 Any text, label, or marker can be printed directly on the tube via ink-jet or laser etch printing. Other options include UV gluing labels and heat shrink labels or markers. These markers are attached to the outside of the tube at a location specified by the customer. UV glued and heat shrink labels can also display any text desired by the customer. CMG generally recommends integrating heat shrink labels (markers) due to their speed, ease of installation and customization, and cost-effectiveness. These labels are often used to display part numbers, installation instructions, or to indicate the fluid flowing through that portion of the system. A tubing assembly from CMG may also include a combination of labeling or marking types, whatever is optimal for your application. 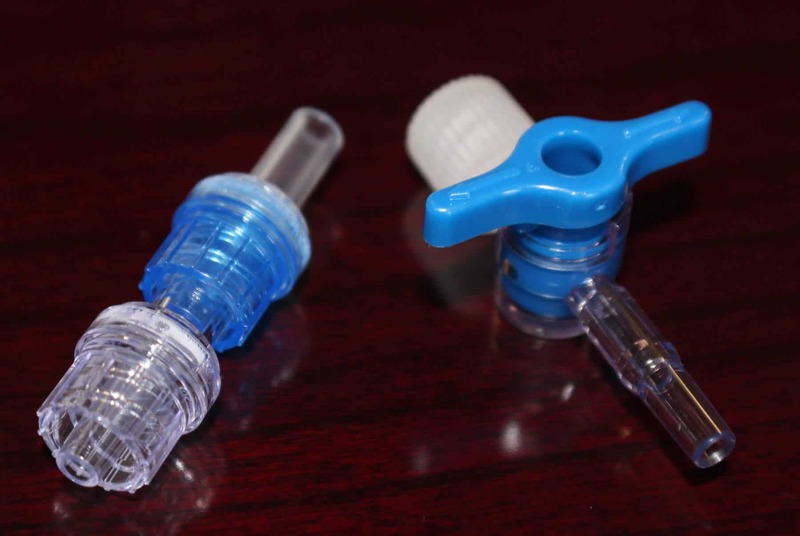 A luer taper or luer lock style connector is used for making leak-free connections in many medical and laboratory applications. In a luer lock connector, the female portion of the fitting typically has a flange that screws into the tapered threads of the male fitting. This allows a secure connection that is easily exchanged or replaced. A nut is a very common type of fastener that comes in many shapes and sizes, but always consists of a threaded hole that typically mates with a bolt. The nut and bolt threads will match, which allows the friction between them to fasten multiple parts together. To prevent a nut from becoming loose, they are often paired with a locking device such as a lock washer, lock nut, or jam nut. The purpose of an O-ring is to aid in creating a tight seal. In a typical tubing assembly from CMG, the O-ring will fit securely between the tubing flange and a washer. A threaded or other type of connection fitting will screw in to a port to provide pressure against the washer, which then compresses the O-ring. The compressed O-ring provides a leak-free, chemically inert, high pressure seal when paired with our FormFit thermo-molded flanges. Quick-disconnect fittings are exactly what they sound like. They allow the user to quickly and easily make and break tubing connections while the fittings stay attached to the tubing. The advantages are ease of service and installation, and allowing many re-connections without degrading the quality of the connection. A tee fitting is simply used to combine or divide fluid flow by connecting three segments of tubing. The connected tubes can be of similar or different diameters. This is a general term that can refer to any number of connection fittings which attach by use of threaded components. This could include flat-bottom fittings, coned fittings, luers, or many others. Valves are used to regulate or stop the flow of liquids and gases. They can serve multiple purposes in an application, and are therefore categorized by their use. Isolation valves can be used to cut off flow to/from part of a system. This could allow maintenance, installation, or emergency shut-off. Check valves or “non-return valves” allow a fluid to flow freely in only one direction, preventing flow in the opposite direction. A throttling valve allows control over the quantity or pressure of a fluid that is flowing through an application. Typically a washer is used to distribute the load of a fastener (like a threaded connection fitting) onto another piece of hardware when torque is applied. A plain washer or “flat washer” is essentially just a small disc that typically has an OD (outer diameter) about twice the size of its ID (inner diameter). There are many types of washers, but flat washers are the most commonly used in a flanged tubing assembly from CMG. They distribute the pressure from a fitting onto the O-ring, spreading the load evenly to help create the leak-free seal.